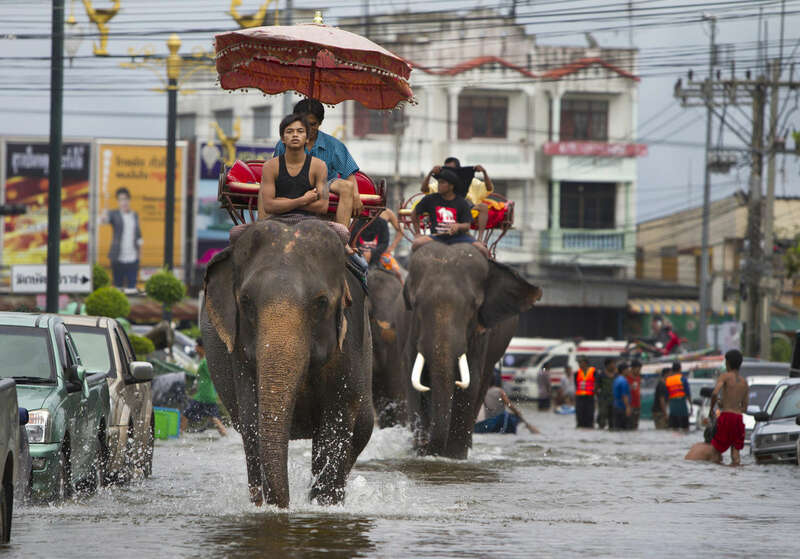 AYUTTHAYA,THAILAND - OCTOBER 10TH: Thai mahouts ride their elephants through the flooded streets October 10, 2011 in Ayutthaya, Thailand. The elephants are from a nearby elephant camp. Around 200 factories closed in the central Thai province of Ayutthaya because of flooding, which is posing a threat to Bangkok as well. Over 260 people have died in flood-related incidents since late July according to the Department of Disaster Prevention and Mitigation. Some areas of the country are experiencing the worst flooding in 50 years, mainly in the centre, north and northeast.